Wash and dry spinach, Bibb lettuce and dill. 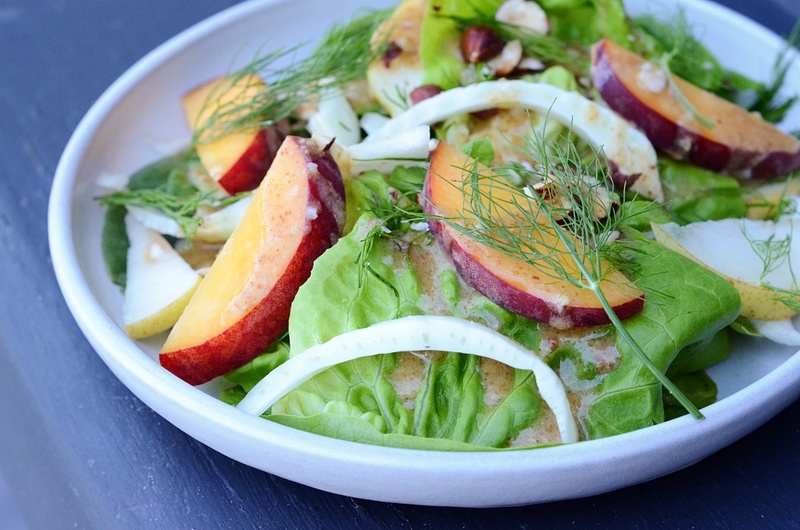 Tear Bibb lettuce into bite size pieces and chop the dill. Place the greens and dill in a bowl. Blend the rice wine, oil, almond butter and lemon juice. Add pepper to taste and salt if needed. If you would like the dressing to be thinner, add a little water. Thinly slice the fennel and place in the dressing to marinade and soften until you are ready to serve the salad. Thinly slice the pear and peach. When you are ready to serve the salad, toss in the marinated fennel with the dressing. Add in the pear, persimmon and top with crushed hazelnuts.